Learn to Skate/Play Hockey | Yale Youth Hockey Association, Inc. 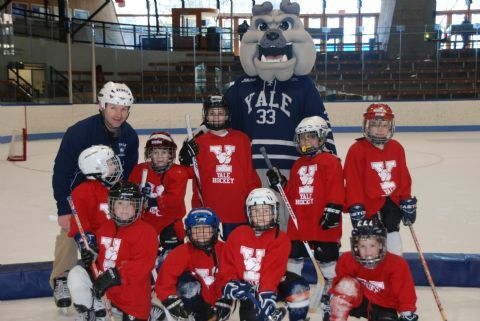 The Yale Youth Hockey Clinic is directed by Shaun Hannah, formerly the Head Coach of Division I Sacred Heart Pioneers for 13 Years. Shaun played and was named Captain of the Cornell University Men's Hockey team, and played professionally for two seasons. He was named MAAC Coach of the Year in 2000. He is the Director of Power Skills Hockey Academy. We are excited to have Shaun as Clinic Director. Shaun is an exceptional person, dedicated to his family, the sport of hockey and to Yale Youth Hockey. At Yale Youth Hockey Clinic children will learn the fundamentals of skating that are needed to develop into a hockey player per the American Development Model set forth by USA Hockey. Clinic Sessions will be conducted in the AM on Saturdays and Sundays beginning early October. However, some sessions may be in the early afternoon. With a reasonably consistent attendance your child should positively develop their skating ability and with some desire, be able to go on to the next step. Children will also have stick time in the clinic at Yale as well. They will be taught some fundamental puck handling skills and shooting skills and will also break out into cross ice games frequently in a house league format. There is also room for advancement to our travel and light travel teams so that players will end up in the best place possible for their overall hockey and skating development. All Clinic skaters are required to wear full hockey gear from head to toe. Many of the local hockey shops have beginner packages that are both new and used. The coaching staff at Yale can also consult with you if you are unsure of what to purchase. See below for descriptions of hockey equipment. Selection of hockey equipment is an important issue for players, parents and coaches. When purchasing and fitting hockey equipment, remember two important factors: 1. Ensure the player is adequately protected and 2. Ensure the fitting allows freedom of movement so the player can properly perform the necessary skills. This will allow your child to be more comfortable on the ice and enjoy playing hockey. Skates: Purchase skates that will fit your child today, with no more than 1/2” allowed for growth and with adequate protection in the ankle, toe and instep areas. Improperly fitted skates will hamper your child’s ability to skate. Sharpen skates following approximately 10 hours skating. Helmet: Ensure a proper fit. The chin strap must always be fastened. The helmet must be of approved by the Hockey Equipment Certification Council (HECC). Facemask: The facemask must be approved by the Hockey Equipment Certification Council (HECC). Mouthpiece: A mouthpiece is not required for Learn to Skate / Clinic players. A mouthpiece is required for House and/or Travel team players. Stick: Stick length should generally extend from the ice to the player’s chin (with skates on). Shin Pads: Ensure shin pads protect the knee and shin completely. Supporter and Cup or Jill: Essential protective equipment. Gloves: Ensure proper fit with good finger and hand mobility. Shoulder Pads: Ensure proper fit. Pants: Ensure proper fit. Pants provide protection for the lower spine, hips and thighs. Elbow Pads: Ensure proper fit. Goaltenders: Special equipment is necessary for goalies.